More friends and a blog: Blasted Thing!! Not long ago I posted about this guy eating our walnuts. We were quite happy to have him hanging out in our yard and made no attempt to dissuade him from taking as many walnuts as he wanted. Even though he would quite often squawk away early in the morning and disturb our sleep on the odd morning when we slept past 6am we were still pleased to have him. I am nothing if not animal friendly, and throughout my life I have happily cared for an odd assortment of critters that have somehow come to be a part of my life. What I am trying to convey is that, normally, I am more than happy to share of myself and my belongings with all my animal friends and that I actually spend a fair amount of time making sure that my yard has an assortment of plants, food and shelter for the animals to make free use of. However, yesterday after my final check up from the SIR folks (who I am happy to say found ZERO evidence of coddling moth on my trees and tree bands- Yippee) I noticed an apple on the ground under one of my trees. I know it had not been there earlier because I had just shown that tree to the SIR person and they don't like to see stray apples hanging around on the ground (potential hang out for moths, I guess). I went over to get it and noticed that there was another one on the ground that looked a bit chewed. Weird, thought I. Maybe the boys? I picked them up, tossed the chewed one, kept the good one that had just fallen and got back to work. A few minutes later I heard another one fall. More weird I thought and went to investigate. Right there, on the fence post, in front of my very nose was the culprit. He was knocking off My Apples! so that he could eat them. Aargh! * Now here is where you need some background info so you know why even one apple stolen annoys me. I think that I have managed to avoid ranting about the amount of work that I have had to do to even be allowed to grow my apples and pears organically here. I mentioned it briefly here but really I try not to talk about it much or let myself think about it because I am afraid that I will run mad. (hee hee) I have spend ages pruning, thinning, observing (this means checking every apple and pear at least weekly for any signs of coddling moth infestation and that is the part that really annoys me) and mixing concoctions to make natural (but very stinky) traps. It was a helluva lot of work for an amount of organically grown fruit that will only last us a few weeks. But, and this is a big but....when someone tells you that you cannot grow these things organically properly on your own property, that you should strip or spray chemicals....what choice is a person (like me) left with? Really, I think it is important to prove that it is possible to do so and that anyone willing to do so should be encouraged, not discouraged. So, because I like to walk the walk, more than talk the talk, I thought it was very important to do this and to let my boys see me live up to my standards no matter what the work. So, in the end we are very much enjoying the fruits of our labour. Now, back to the squirrel story. The bugger was sitting right there taunting me by flicking my hard-earned apples onto the ground! He was, I swear. So, here is the moral of this story. You Don't Want To Mess With Them Apples You!! Do not make me repeat myself on this or it will not be pretty. Thieving, manky little weaselly rodent! Stick with the walnuts and you will be fine. We can co-exist peacefully. You can even start in on the Hazelnuts. But You Will Not Touch My Apples Again or I may be forced to unleash Putty the terror kitty on you. Mark my words!! Ahem, now I'm sorry it has had to go this far but I will not be provoked in that way oh little fellow critterly being on this lovely planet Earth. I am sure we can continue our friendship in a much more pleasant manner if you just follow this simple, entirely reasonable, request. 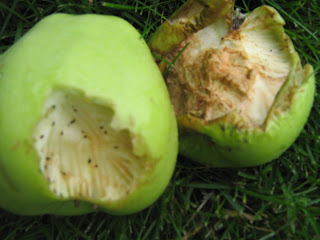 I am quite happy for the squirrels and raccoons to eat my walnuts too, as I don't eat many myself, but I would be annoyed if they were raiding my fruit trees!!! Maybe the boys could make a couple of catapults and discourage the squirrel. Wow! Nobody messes with Heather and her apples! !